Choosing the options for your new hot tub cover, it’s pretty easy to get bogged down in unfamiliar terminology. Not many people come in to hot tub ownership knowing what double wrap foam, full length steam stops and energy undersides are, or why they are important. It’s also not obvious why foam density matters so much. Hot Tub Cover upgrades can be very important to add to your cover based on your environment and usage. This post should help clear up some of that confusion so you can make some informed choices. Your hot tub cover will be made of a few standard parts. The outer skin is made of marine-grade vinyl, to protect against weather and the elements. This vinyl is wrapped around foam inserts. The foam inserts are wrapped in a clear plastic membrane called a moisture barrier. This keeps the foam from absorbing water and losing its insulating properties. There will also be one or more hinges that allow the cover to fold as it is removed. The foam is the most important component in your hot tub cover. It’s the foam that does the work of keeping the heat in the tub. Hot tub covers use “high density foam” – the same type of foam used in memory foam mattress toppers. The two aspects of the foam you need to pay attention to are the foam density and the moisture barrier. 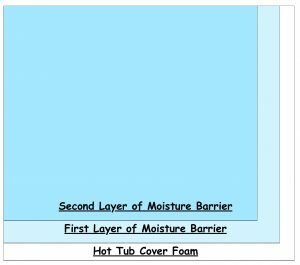 Foam density is important – denser is better – because it affects how much heat the cover can keep in the tub. The denser the foam the more insulating value it holds. The density is measured by the pound per square foot. The common hot tub cover density’s is 1, 1.5, and 2 pound density. 2 pound density foam will give you the best insulation and will hold the most weight or load on top of it. So this is a great upgrade for hot tub owners in cold, heavy snow area’s. It is also a great upgrade for resorts or for anyone who has children, pets, or friends that can’t seem to stop walking, or sitting on their hot tub cover. The double vapor barrier is another nice upgrade. The common down fall to any hot tub cover is the saturation of the foam cores. This happens because the chemicals in the hot tub breakdown the poly wrap that surrounds the foam cores over time. Having two layers of protection delays this saturation of the foam cores significantly. Double wrapped foam just means that the foam inserts in the cover have been wrapped in two layers of poly moisture barrier. This helps make sure that the water stays in the tub and out of the cover. It also helps your cover last considerably longer. This is a simple addition that can make a big difference. An energy underside is just a coating of heat-reflective material on the underside of the cover. Rather than merely blocking the heat like the foam does, it reflects it back into the water. You can think of it as “active insulation.” Depending on your climate, this can make a significant difference in your hot tub heating costs. The hinges are the Achilles’ heel of a hot tub cover. It doesn’t matter how dense the foam is or how well the underside bounces heat back into the water if the hinge is acting like an open door. The full length steam stop is a great upgrade that fills the gap between the foam inserts when it is on the tub. The upgrade is specifically important in the colder area’s of the country. This prevents heat from escaping through that gap. Simple, and effective. Hot Tub Cover caps can help in just about every climate to help prolong the life of your cover. 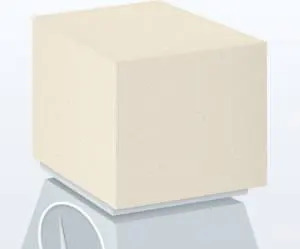 The cover cap will aid in wicking away moisture and debris from the outside elements. In particular the cover cap will help against sun and ice damage. The last item you may want to look at is a cover lifter. 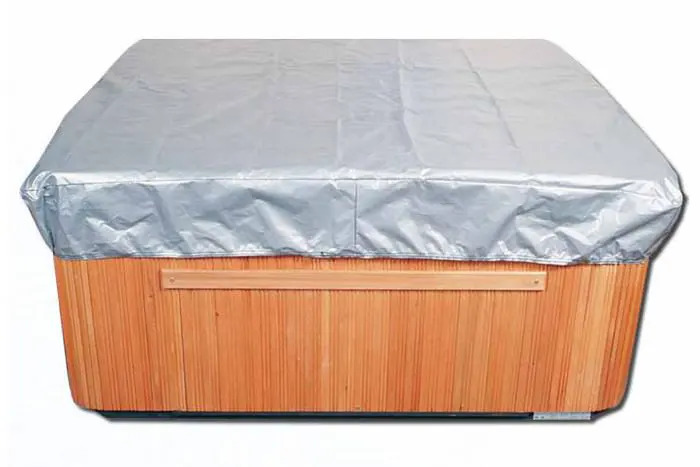 The hot tub cover lifter is a really nice Hot Tub Cover upgrades that will help you remove and replace the cover in a way that it can’t be damaged and will also just make it easier to go for a relaxing hot tub. So there you go. All of the standard Hot Tub Cover upgrades demystified. Mostly they are just ways of keeping more heat in the hot tub and prolonging the life of your cover. Hopefully this gives you all the info you need to choose the right cover for you.